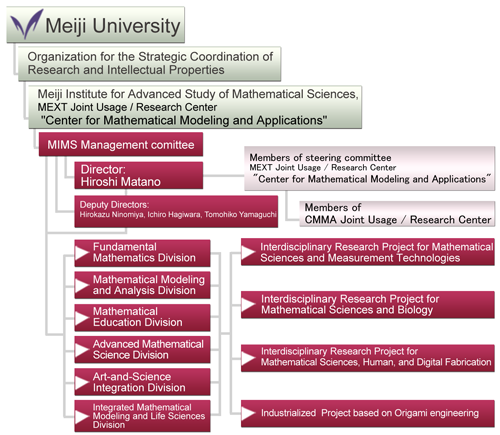 Meiji University will establish the Meiji Institute for Advanced Study of Mathematical Sciences (MIMS) was an international research center pursuing mathematical understanding of social and natural phenomena in order to promote and develop mathematical sciences that stress the relationship with society. The international research network on Reaction-diffusion systems in Mathematics and Biomedicine (GDRI ReaDiNet) has been started from 2015 under the cooperation among six research institutions of MIMS and Department of Mathematical Sciences of University of Tokyo (Japan), Paris-Sud University and University of Nice Sofia Antipolis (France), Kaist (Korea), National Center for Theoretical Sciences (Taiwan). Through Mathematical Sciences based on modeling and analysis, we focus on understanding of complex system arising in biomedicine and develop theoretical methods on analysis and numerical simulation under international cooperation with other research institutions. Creative interaction technologies, which assist each individual to design and fabricate objects he/she really wants, are researched, using mathematical science. Nowadays, we can create objects easily owing to the recent development of digital fabrication techniques, such as 3D printers. However, it is still difficult for us to design them satisfactorily enough. This research project aims at developing technologies to realize the most satisfactory design based on each person’s preference, using interactive methods and machine intelligence with mathematical model of human subjective sense. Moreover, this project renews the conventional mass-production and mass-disposal society to bring us better life by establishing the technologies to easily create what each person really wants and needs by him or herself. In order to design an object which is preferred by many people, the design should be estimated by stochastic way concerning people’s liking. However, if we want to design it for a certain person, his/her requirement must be considered in the design. Moreover, his/her satisfaction usually gets influenced by evaluation and suggestion by other people. In this project, how to design objects reflecting each person’s requirement is researched, by introducing interactive methods to mathematical model on human subjective sense for designs. Here, a method to estimate the most satisfactory design by mathematical model and human-computer interaction, on the basis of machine learning such as interactive evolutionary computing, effective computer interfaces which enable users to reflect their intention to the design sufficiently, and a method to actively introduce other persons’ evaluation and suggestion effectively to the design method are researched. Research Period: till March 2020, the date of middle evaluation of COI project. This project aims to bring the advanced origami geometry, the computational science simulation and the production science together to find the solution for industrialization of origami structure. We conduct joint-researches in terms of the origami geometry and the computational science along with scientists and engineers from production filed. Here we play a role to act as hub of interdisciplinary fields to find common issues and construct fundamentals for the solutions, by that makes origami structure industrial. Despite the origami engineering based on Japanese traditional art "origami" had been widely expected to be industrialized, it has not yet fully used in the industry except the space industry where expensive production costs are allowed. it is difficult to maintain the stability after its shrinkage. it is not stable after its deployment. it is difficult to manufacture a product by origami structure which has more complex structure than ordinary manufacturing method and still needs to have appropriate functions of the product at low cost. how to fold a beverage container after drinking up (on the above subject 1). how to fold up cardboard boxes(on the above subject 2).